After 2 months of packing, planning, prepping, and fretting, I finally boarded a plane to Bermuda in mid August to take part in a research cruise aboard the R/V Atlantic Explorer. This was set to be the third and final research expedition of my PhD, and I had firm plans to tie up some loose ends from previous sampling and to [hopefully] confirm a few hypotheses I’ve been juggling about for the past year. Like any research expedition, we faced a few hurdles with engine troubles and impending tropical storms, but managed to leave port only 2 days late, and were able tack on an extra day of sampling on the end to make up for lost time. All in all there was no harm done, except maybe to my ever-dwindling research training and support grant, which certainly took a few hard knocks with flight changes. We left from St. George’s, Bermuda on Sunday, August 19th and slowly steamed out towards the Bermuda Atlantic Time-Series Study (BATS) site (which lies in the north-western North Atlantic subtropical gyre). My work focuses on diazotrophs (nitrogen fixing organisms), and on this cruise I was specifically interested in Trichodesmium, or ‘Tricho’. (more about Tricho and other diazotrophs here). Models and previous observations predicted Trichodesmium to be in its highest abundances in the Sargasso Sea during the late summer, so the semi-delusional part of me was wishing we would encounter thousands of colonies floating in the surface layer upon arrival at BATS (see image below). That certainly wasn’t the case. Instead, there was barely any about for the first few days, and my hopes of tying up those loose ends were quickly fading. After 5 days, we headed back towards the island to drop off half of the scientists who were only out for BATS sampling, and after less than 2 hours in port we set off again. This time our aim was to penetrate deeper into the gyre and to travel as far south as possible in an attempt to sample more variable diazotroph populations. We steamed ~18 hours a day and stopped twice daily for CTD, plankton net, marine snow catcher (MSC), or in situ stand alone pumping system (SAPS) deployments on our way to 26°N. 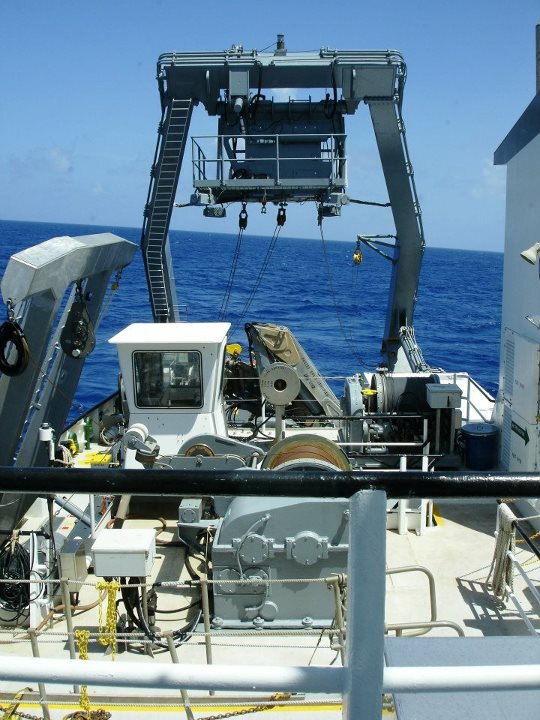 The CTD (or CTD rosette, to give it its full, correct title) — a conductivity, temperature, depth instrument — provides us with a profile of the water column and allows us to collect water from up to 24 different depths per cast. The plankton nets concentrate vast quantities of zooplankton and phytoplankton in the water column, which we can then preserve for identification, and the MSC and SAPS allow us to collect sinking particles. I collected samples using all of these different pieces of equipment to assess for diazotroph presence and influence in the water column. 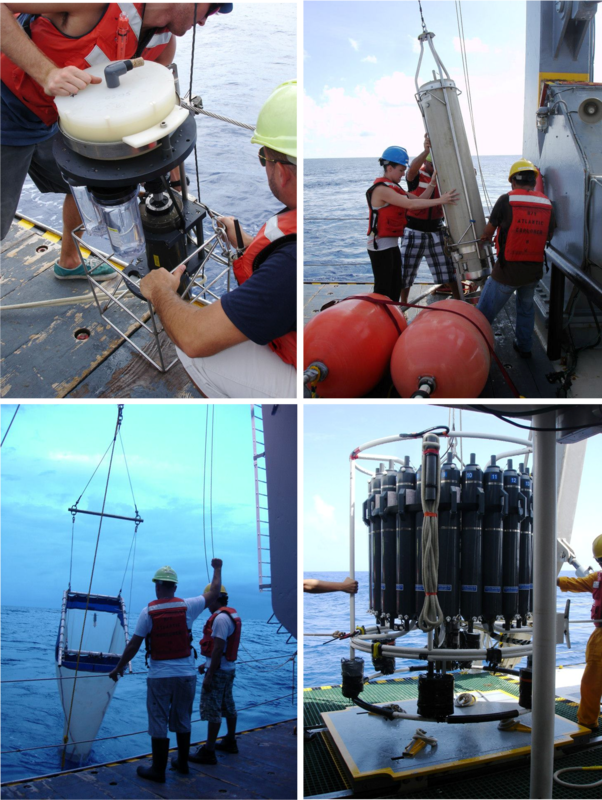 Sampling equipment used: stand-alone pumping system (top left), marine snow catcher (top right), plankton net (bottom left), and CTD rosette (bottom right). We came into Tricho pretty quickly upon travelling south of BATS, and my deployments really started to pay off. Diazotrophs, including Tricho, are very important in this region of the ocean because the nutrients required for phytoplankton growth are in very low concentrations, and only diazotrophs are able to convert inert N2 into a bioavailable form that is then accessible by other biota (more about nitrogen fixation here). We sampled southward for just 3 days before turning around to head back north towards the island. Although this cruise was the shortest of all three of my research expeditions, it may prove to be the most fruitful based solely on the intensity and proximity of sampling. Now that I am back in the UK, I can begin to analyze my samples. I will start by quantifying all of the plankton collected via microscopy to get a better idea of what is where. Watch this space for updates on processing progress, and hopefully you’ll soon be able to read more about my work in the literature as I am also currently working on a paper in prep that includes exciting details on Tricho that I can’t share with you yet.